It owes a lot to Indiana Jones, but so far as I’m concerned it’s an improvement to replace Indiana with a hot British chick. I’m finally glad I played Prince of Persia, because I immediately remembered how to climb bits of broken columns and leap from one to another. Fortunately it’s not twitchy like POP; you can take your time with the puzzles, and often there are multiple solutions. Lara is awfully athletic, and it’s fun moving her around these huge maps, kind of like Mirror’s Edge without the speed. If you’ve never played either but have heard about it, you may wonder if the game has any of that vaunted fanservice. 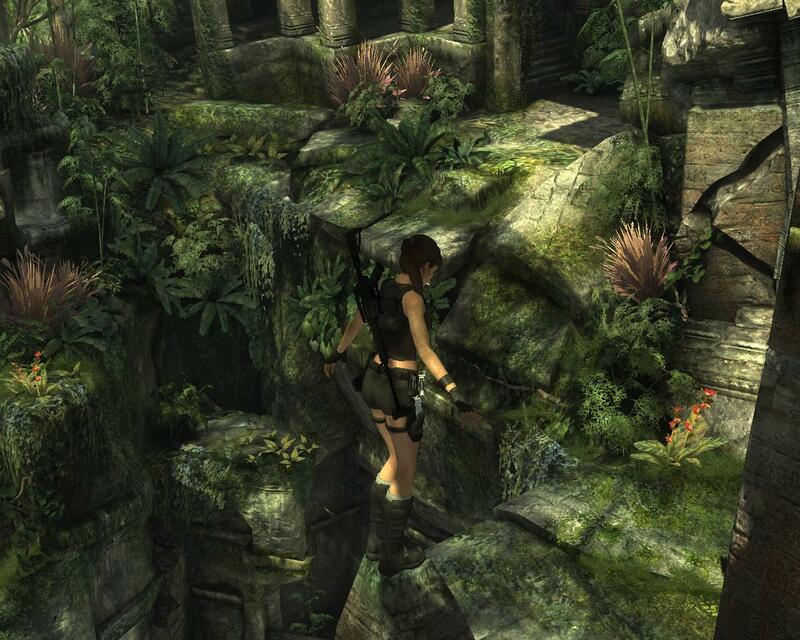 You can choose Lara’s outfit at the beginning of each level. Except for the first, where she explores (and jumps all over) a stone temple barefoot, which sounds ouchy.